Kingspan Kooltherm K8 Cavity Board is a premium performance insulation, with a fiber–free rigid thermoset phenolic core, faced on both sides with a low emissivity composite foil facing which is used for insulation in partially filled cavity walls. 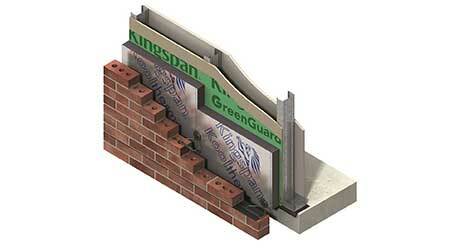 Kingspan Kooltherm K12 Framing Board is a premium performance insulation, with a fiber–free rigid thermoset phenolic insulation core faced on both sides with a low emissivity composite foil facing which is used in wood or steel frame walls. It is resistant to the passage of water vapor, unaffected by air infiltration, and can be used between studs or as an insulating sheathing. Both products feature a core of premium performance rigid thermoset fiber-free phenolic insulant manufactured with a blowing agent that has zero Ozone Depletion Potential (ODP) and low Global Warming Potential (GWP). Both are engineered to take up considerably less space while delivering higher thermal performance and fire and smoke protection than other solutions currently on the market.